I’ve blogged repeatedly on the origins and state of Chaonei No.81, a once lovely house that has managed to avoid destruction and is considered by many to be haunted (though given it is architecturally interesting in Beijing and hasn’t been bulldozed I feel it is more ‘blessed’ than haunted!). 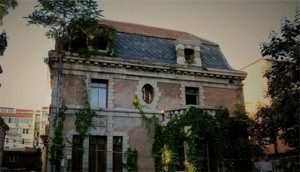 For background on the house and more details of its possible past, potential futures and its ghosts just put ‘chaonei’ in the search engine on this site and it will all appear. The origins of the house are not clear and a number of theories have been posited. My thanks then to Philippe Fourneraut who has been researching the life of Georges Bouillard, the head of Kin-Han railway between Peking and Hankow). M. Fourneraut tells me that, according to Beijing historian Wang Leshun, Bouillard designed and had the house constructed in 1922. He died in Peking in 1930. Apparently M. Bouillard’s wife, Zhu Derong, rented part of it to nuns, and sold it to an Irish priest in 1946. A new detail provided to me by an history student: Bouillard had a meteorological station in this home.